Hey! sweet deal...is the whole thing UV'd too? Yes sir. I forgot to add that. The model has UV's on it already. thanks dude i will try it asap. Hello, i am posting to say a thank you for creating and posting these video tutorials! I have recently started using Zbrush and it can be tricky to use sometimes - though i am progressing much faster mainly due to your Zsphere tutorial. do the tut cover also sculpting of the basic mesh ? 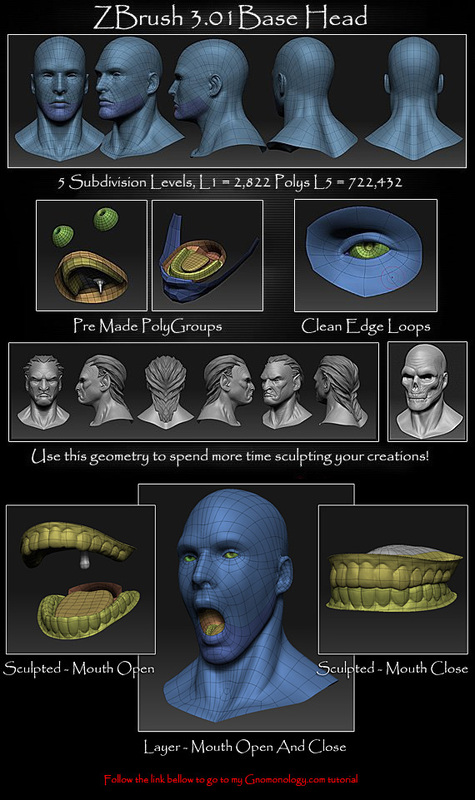 If you are talking about the sculpting process in Maya to create the base geometry then no. I am hoping that you can take a look at my model and use that as a good example of how to lay out topology for the face. Beyond that it is a nice head to start creating new pieces of art work with. I'm learning Zbrush and I'm also new to 3d in genreal. I bought your tutorial from Gnomonology last week and found it very useful. Good value for money. I got a lot out of it, I now use polygroups to do rapid selections and my enjoyment of Zbrush has gone up tenfolds.